A year has passed since the repose of Russia’s righteous elder, Archimandrite John Krestiankin of the Pskov-Caves Monastery. But his memory has far from faded; to the contrary, it is spreading far beyond the Russian borders, his writings being translated into other languages. Pravoslavie.Ru (English edition) is therefore pleased to present each week day excerpts from the forthcoming book May God Give You Wisdom! The Letters of Fr. 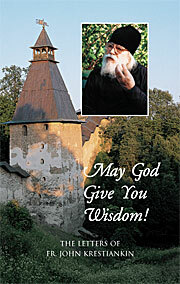 John Krestiankin (published by Sretensky Monastery and St. Xenia Skete). May our readers find in them answers to perplexities, sober instruction, and deep Christian wisdom, coming from a true elder and confessor of the Faith.